Our Wenge Dimensional Lumber is cut to exact sizes lists. These pieces are NOT nominal widths. These pieces are S4S machined milled (surfaced on all 4 sides cut to width and length). Wenge lumber has heartwood is medium brown, sometimes with a reddish or yellowish hue, with nearly black streaks. 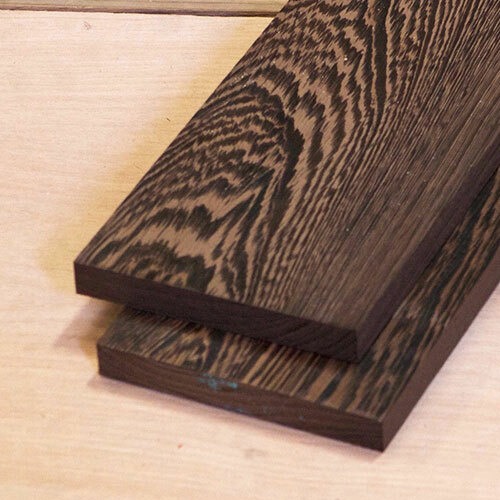 Upon application of a wood finish (particularly an oil finish) the wood can become nearly black. Wenge wood has grain that is straight, with a very coarse texture. Low natural luster. Can be difficult to work with hand and machine tools. Blunts tool edges. Sands unevenly due to differences in density between light and dark areas. Very splintery—care must be used when handling unfinished wood with bare hands, as splinters have an increased risk of infection. Very large pores can be difficult to fill if a perfectly smooth/level finish is desired. * Wenge by the piece maybe sawn up to +/- 1/16″ of size listed. These Wenge Dimensional Lumber pieces are solid hardwood. For specific requests please contact us. You can also place instructions in the order notes box at checkout. All orders will ship will 48hrs based on stock and availability.